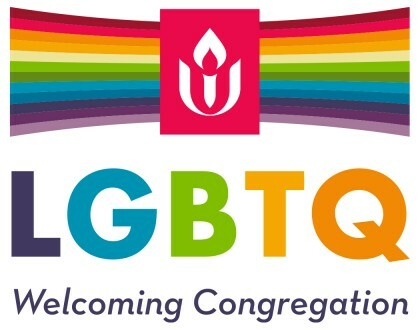 We are a Welcoming Congregation, recognized by the Unitarian Universalist Association as a congregation that includes and affirms the whole lives of people who are lesbian, gay, bisexual, transgender, and queer at every level of congregational life—in worship, in program, and in social occasions. People who identify on the spectra of LGBTQ+ identity are fully part of this congregation and denomination. Not a “them” but equal parts of an “us.” We continue to grow in our understanding of human diversity. Good Morning! Welcome to our Fellowship! This Fellowship honors the person you authentically are. We see diversity as a source of strength and have committed to honoring the lives, relationships, and equal participation of persons whose sexual orientation or gender identity has not always been accepted by others. Whatever labels you claim for yourself, have inherited, or have been assigned by others, you are welcome here. No matter your challenges or abilities, you are welcome. Together we are part of an interdependent web of existence. Each one has inherent worth. Welcome. Not assume anyone’s affectional/ sexual orientation and/or gender identity. Vocabulary of worship reflects this perception; worship celebrates diversity by inclusivity of language and content. Fully incorporate throughout all programs, including religious education, an understanding of the experience of lesbian, gay, bisexual, transgender, and queer persons. Include in the bylaws and other official documents of the UUFW an affirmation and nondiscrimination clause affecting all dimensions of congregational life, including membership, hiring practices, and the calling of religious professionals. Engage in outreach into lesbian, gay, bisexual, transgender, and queer communities, both through its advertising and by actively supporting other lesbian, gay, bisexual, transgender, and queer affirmative groups. Offer congregational and ministerial support for life cycle events, including weddings and memorial services, for persons who are lesbian, gay, bisexual, transgender, and/or queer, and celebrations of evolving definitions of family. Celebrates the lives of all people and welcome same-gender couples, recognizing their committed relationships, and equally affirms displays of caring and affection without regard for sexual orientation. Seek to nurture ongoing dialogue between people of different affectional/ sexual orientations and gender identities, and to create deeper trust and sharing. Affirm and celebrate lesbian, gay, bisexual, transgender, and queer issues and history during the church year. Be an advocate for lesbian, gay, bisexual, transgender, and queer people, attending to legislative developments and works to promote justice, freedom, and equality in the larger society. Speak out when the rights and dignity of lesbian, gay, bisexual, transgender, and queer people are at stake.